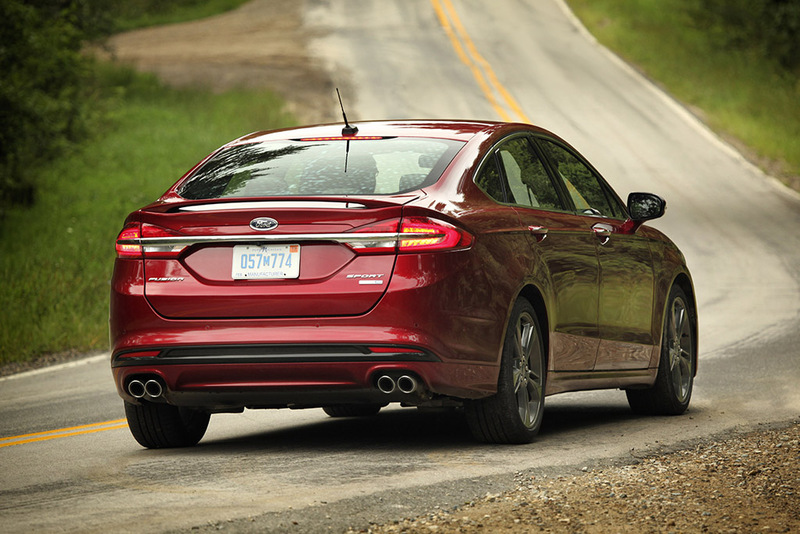 and 2017 Ford Fusion are two of the best midsize sedans to drive and are certainly two of the best looking. They have strong, fuel-efficient turbocharged engines and even offer excellent hybrid models. Their interiors are also attractive and packed with the latest tech. And yes, they’re produced by American car companies. It wasn’t too long ago when that was all that Ford and Chevy’s midsize sedans could really hang their hats on when trying to draw customers away from wildly popular Japanese brands. No more — the Fusion and the Malibu are legit, regardless of their corporate origin. Yet which of these two red, white and blue sedans would be better for you? Let’s help you find out. After being completely (and very successfully) redesigned last year, the Malibu heads into 2017 with minor changes. The old 2LT trim has been discontinued, and the Premier’s 8-speed transmission has been replaced by a 9-speed unit. The current Fusion gets its first significant update for 2017. The styling has been massaged ever so slightly to actually improve one of the best-looking family sedans. There’s also a laughably powerful new V6 Sport model and an almost laughably luxurious Platinum trim level. The inside features a redesigned center console with an electronic rotary shifter and improved storage, but perhaps the biggest advancement is the new SYNC 3 touchscreen tech interface, which corrects one of the Fusion’s major flaws. The Malibu is still pretty new since it was redesigned, so there hasn’t been much time to determine any potential long-term issues. There haven’t been any significant common issues thus far, though, and prior Malibus demonstrated average reliability. The current Fusion has been around for several years and has demonstrated above-average reliability. In fact, even past versions of the Fusion are some of the more reliable cars on the road. If history is any indication, Ford has the advantage here. The 2017 Malibu comes standard with a 1.5-liter turbocharged 4-cylinder engine that produces 163 horsepower and 184 lb-ft of torque. That’s a modest amount for a midsize sedan, so don’t expect strong acceleration. It may feel potent initially around town, but prolonged acceleration, like highway merging, will demonstrate its weakness. Fuel economy, however, is quite strong at 27 miles per gallon in the city, 36 mpg on the highway and 30 mpg in combined driving. The 2017 Fusion comes standard with 2.5-liter 4-cylinder engine that produces 175 hp and 175 lb-ft of torque. It’s OK, but we recommend opting for the more potent and efficient 1.5-liter turbo 4-cylinder that produces 181 hp and 185 lb-ft of torque. It returns 23 mpg city/34 mpg hwy/27 mpg combined. Things don’t stop there. The Malibu Premier trim comes with a 2.0-liter turbo four that’s good for a far more competitive 250 hp and 260 lb-ft of torque. It still returns a thrifty 22 mpg city/33 mpg hwy/26 mpg combined. The Fusion also offers a 2.0-liter turbo, but it’s more widely available throughout the lineup. It produces 240 hp and 270 lb-ft of torque and returns 21 mpg city/31 mpg hwy/25 mpg combined. 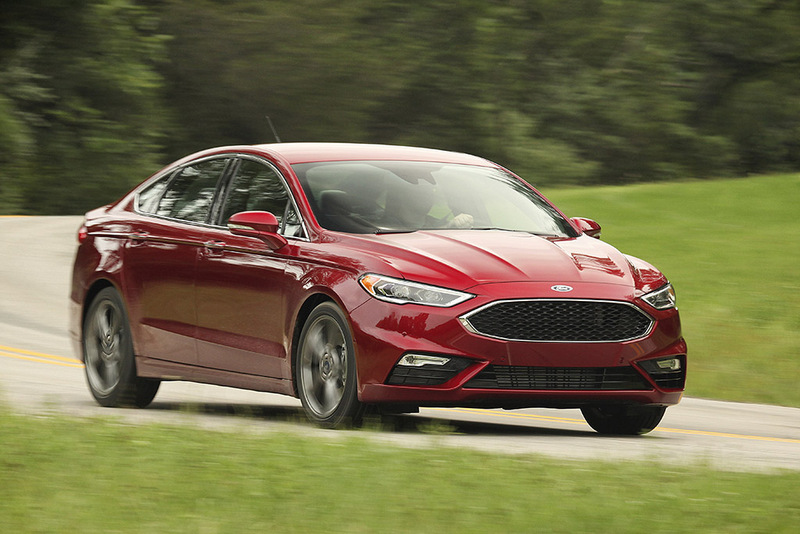 The Fusion also offers something no other midsize sedan can match — a 2.7-liter turbocharged V6 good for an eye-popping 325 hp and 380 lb-ft of torque. It returns 17 mpg city/26 mpg hwy/20 mpg combined. And finally, there are the hybrids. 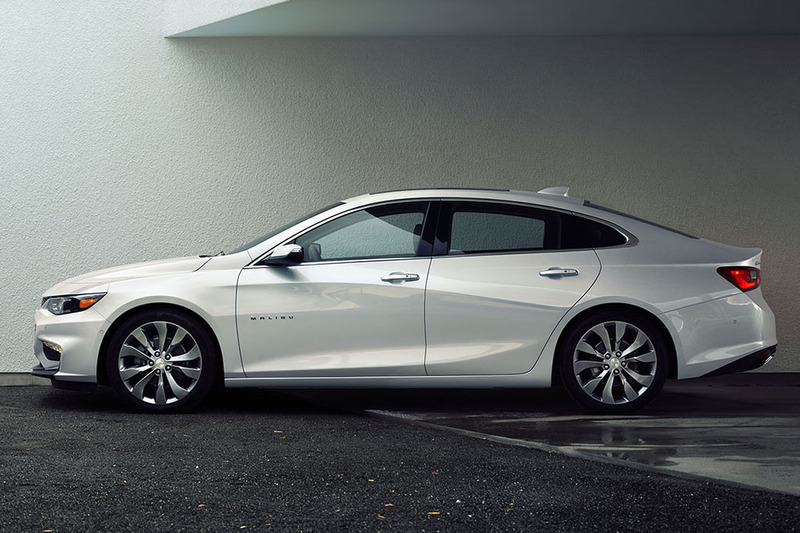 The Malibu Hybrid relies more heavily on its electric motor, creating a driving experience comparable to that of the Chevy Volt (albeit without the plug-in all-electric range). It returns an excellent 49 mpg city/43 mpg hwy/46 mpg combined. The Fusion Hybrid behaves more like a traditional hybrid (not necessarily a bad thing, just a difference) and returns 43 mpg city/41 mpg hwy/42 mpg combined. Yes, that’s lower, but it equates to only about $50 more per year than the Chevy. 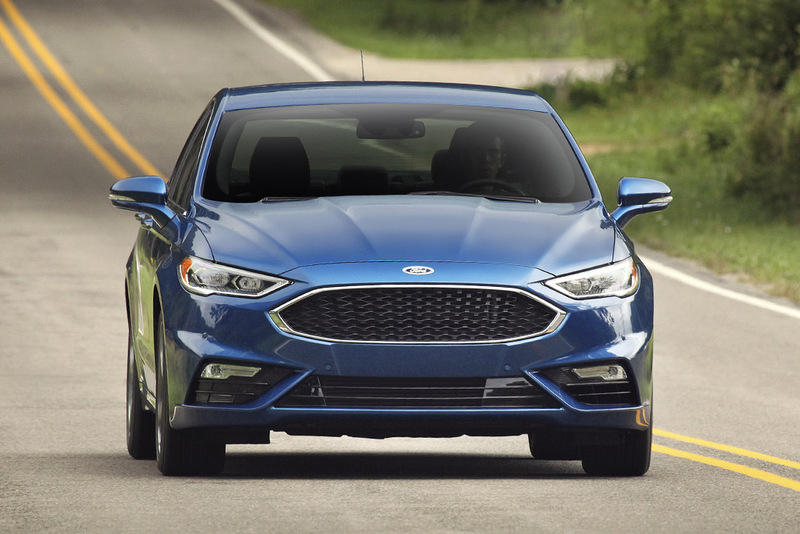 The Fusion and Malibu’s standard safety features list is basically identical: front-side airbags, front knee airbags, full-length side-curtain airbags and an emergency telematics system with automatic crash notification. The Malibu’s OnStar system does include more features, however, and doesn’t rely on your smartphone to work. Optional content is basically the same, too, as both offer packages that include forward-collision warning, automatic braking, blind spot monitoring, rear cross-traffic warning, lane keeping and adaptive cruise control. The government gave the Malibu a perfect five stars overall, as well as for front- and side-crash protection. 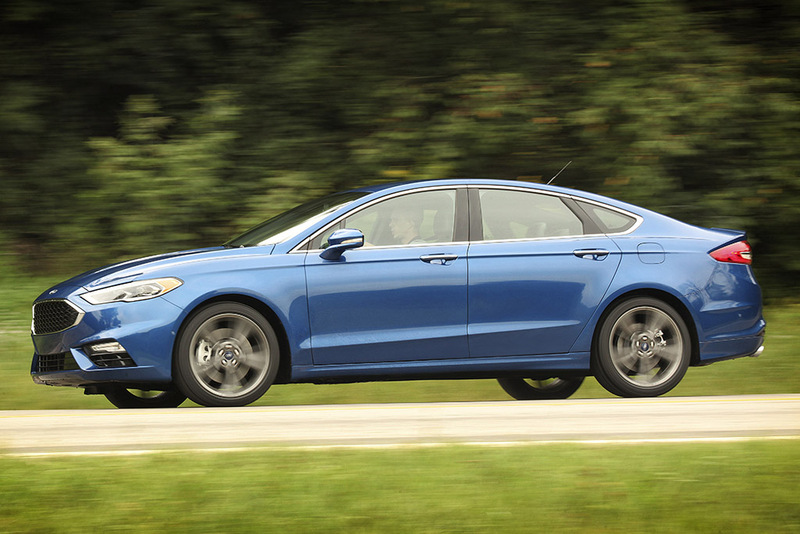 The Fusion got five stars for overall and side protection, but got four stars for frontal. The nonprofit Insurance Institute for Highway Safety named the Fusion and Malibu Top Safety Picks for their best possible score in all pertinent categories. The Fusion gets a big leg up for 2017 thanks to its new, more user-friendly and feature-rich SYNC 3 touchscreen interface available on all trims but the base S. It features easily read and pressed virtual buttons along with Apple CarPlay, Android Auto, media-player voice recognition and various internet radio control apps. We highly recommend it, as the basic “SYNC with MyFord” setup of a small display and accompanying buttons is cumbersome to use. The basic system on the Malibu is much better, as it’s a simple touchscreen. The upgraded Chevy MyLink system, available in 7- and 8-inch sizes, may be a tad more complicated than SYNC 3 in some spots but is generally easy enough to use. Its customizable homepage icons will be instantly recognizable to any smartphone user. 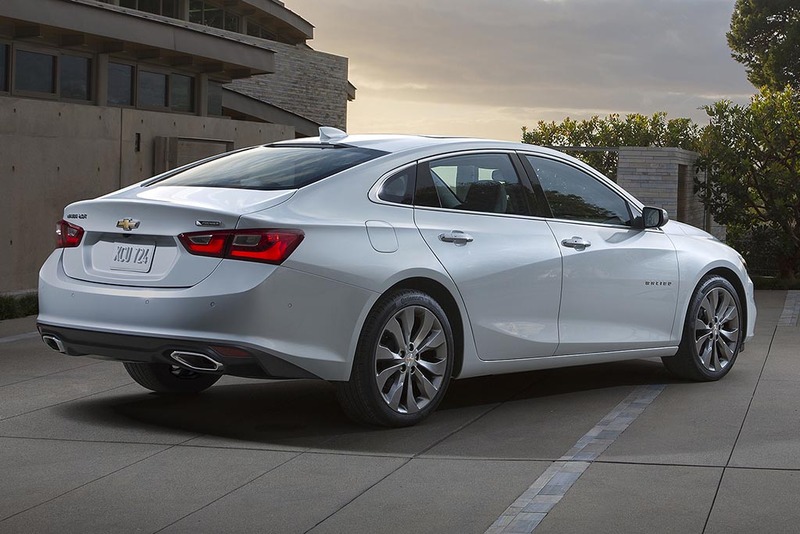 It too has Apple and Android connectivity, and although you can’t talk to a media player, the Malibu can be had with integrated Wi-Fi. 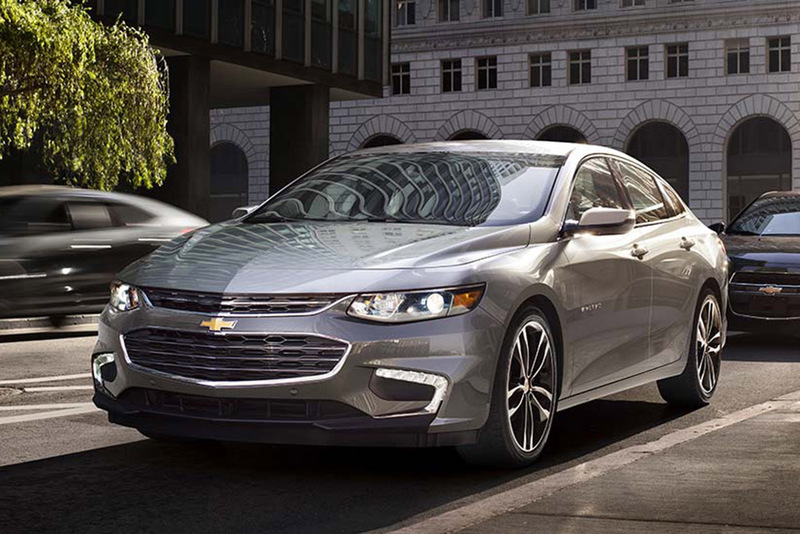 Both the Malibu and Fusion are seriously good to drive, with responsive handling and general refinement we bet you wouldn’t expect from a midsize family sedan. This even applies to the hybrids, which are usually dull, odd or straight-up irritating to drive. There are clear differences between the two, however. The Malibu is ultimately the more driver-focused of the two cars and feels a bit sharper. Chevrolet was trying to create an athlete and it succeeded. The Fusion is more rounded. It too handles corners well, and many may prefer its steering, but it also has a bit more ride compliance and composure due to its sophisticated suspension. This Ford feels like a fancier, more expensive car to drive than it really is. 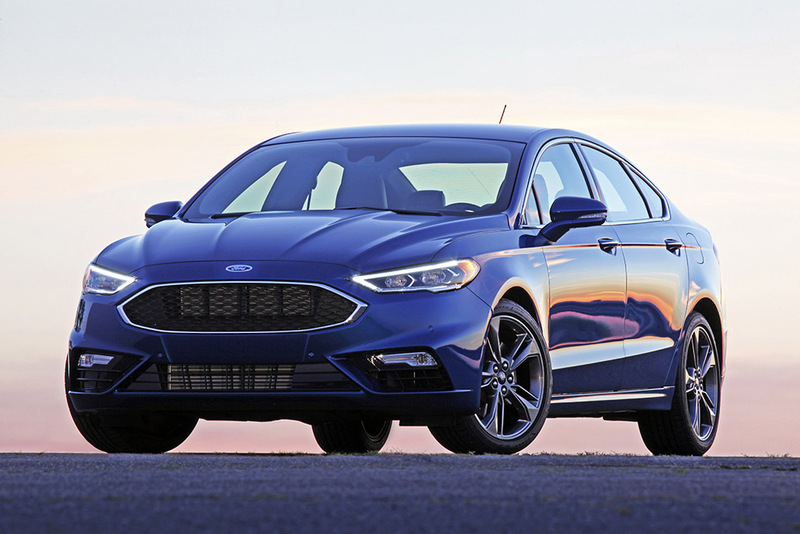 Despite the Fusion being out for several years now, it still stands out with excellent build and materials quality for a midsize sedan. Certain color combinations — and especially the ritzy Platinum trim — look and feel genuinely luxurious. Its redesigned center console for 2017 also makes it a bit more functional than the Malibu’s. 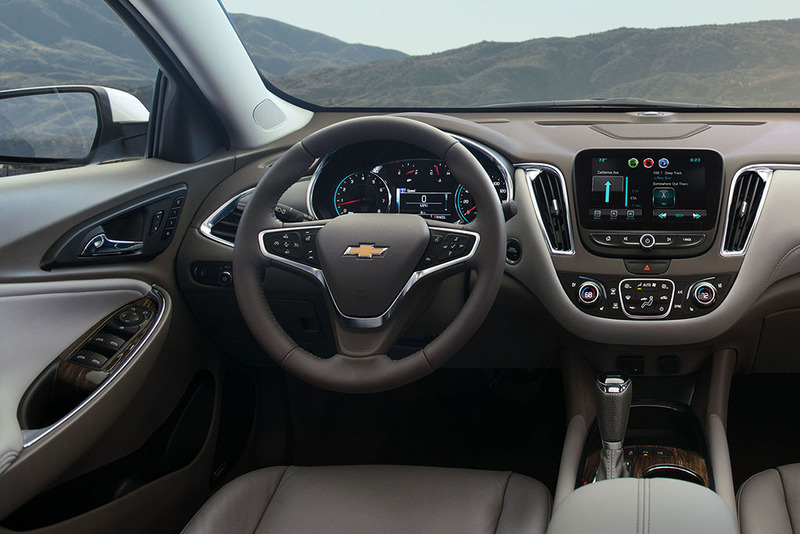 As for the Chevy’s cabin, its organic curves earn some style points, and its quality is certainly up from past versions. However, its plastics can be a bit cheap and it definitely lacks the Fusion’s premium vibe. A clear victory for Ford here. 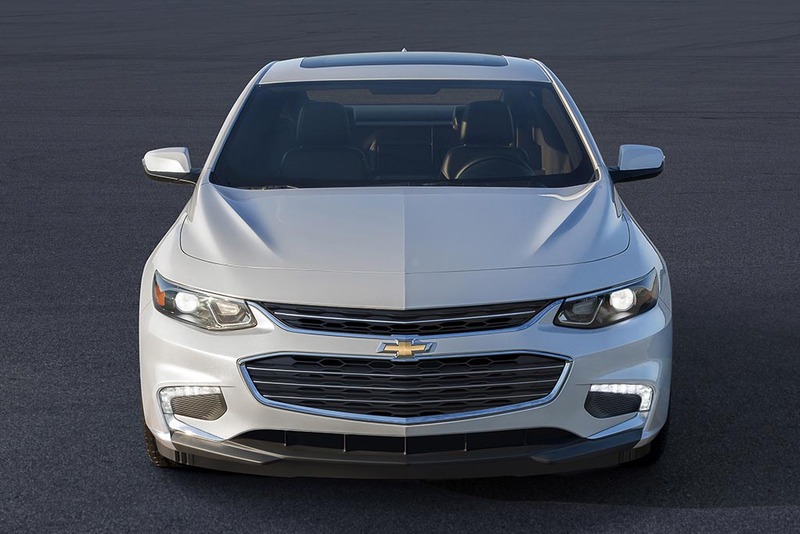 The Fusion and Malibu seem pretty evenly matched at first, but dig a bit deeper and you’ll see the Chevrolet has a slight advantage. Take the midlevel LS trim level, for instance. It starts at around $24,000 and includes the 1.5-liter turbocharged engine, Apple CarPlay, Android Auto and its 7-in touchscreen interface. The comparable Fusion SE is about $400 cheaper, but you have to pay extra for its small turbo engine and SYNC 3, resulting in a price closer to $25,000. In other words, the Ford gets you a bit with options. 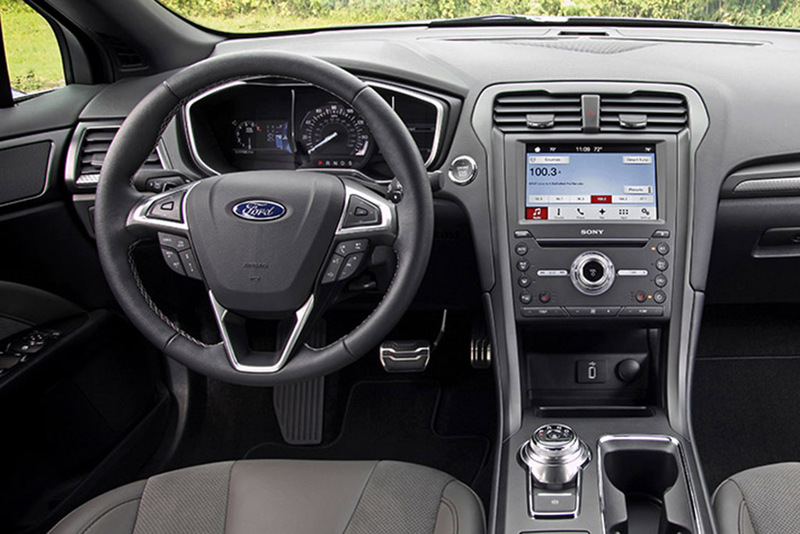 On the other hand, there is certainly value in the Ford’s superior cabin quality, reliability and overall refinement. It’s also worth looking at resale value, as the Malibu is likely to depreciate about $3,000 more over the course of a typical 6-year ownership span. 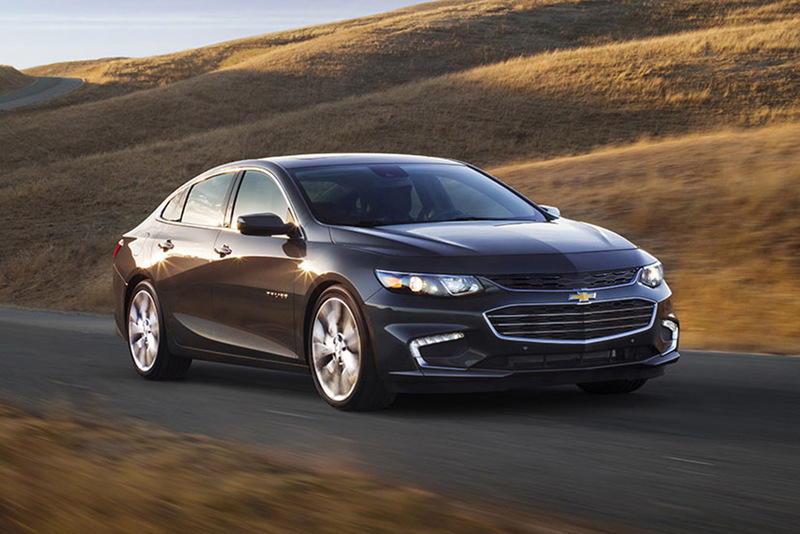 The Malibu is ultimately more fuel efficient; the Fusion offers better acceleration. The Chevy is the better athlete; the Ford is the more sophisticated gentleman. Finally, the Malibu will probably be cheaper to buy (or lease), but that may change over the long run. Really, it just depends on your preferences. In the end, just make sure to drive multiple versions of both before buying any midsize sedan. There are currently no comments on 2017 Chevy Malibu VS 2017 Ford Fusion. Perhaps you would like to add one of your own?